Online echo chambers – in which people engage only with others that share, and media that reflect, their opinions and biases – have become an area of concern in the wake of last year’s startling political upsets. This column investigates how users navigate and explore an online content space. Highly social users and younger users are most likely to get caught in echo chambers, while opinion leaders are less likely to get caught. Reducing the visibility of content popularity information, such as ‘like’ and ‘view’ counts, may help mitigate echo chamber effects. Just as sound reverberates in an enclosed space, so do opinions and information in our social circles. Since ‘birds of a feather flock together,’ these social circles consist mostly of like-minded individuals, making it harder for dissenting views to permeate our discourse, and creating an echo of our own information and views. This is the echo chamber phenomenon that has been drawing growing concern in a post-election US, a post-Brexit UK, and pretty much everywhere in our increasingly connected world. Echo chambers have always been around, but as our information gathering, social networking, and conversations shift online, they seem to be getting worse. Who should we blame – ourselves, or filtering algorithms beyond our control? Bakshy and colleagues at Facebook research labs find that individuals’ own choices are more to blame for their echo chambers than Facebook’s newsfeed ranking algorithm (Bakshy et al. 2015). Since our past choices and clicks feed into personalisation algorithms (El-Bermawy 2016), the two mechanisms are mutually reinforcing, and will create deeper echo chambers in the long run. In recent research, we study what types of users are most likely to get caught in a content echo chamber, and the role of popularity information provision in facilitating them (Bar-Gill and Gandal 2017). 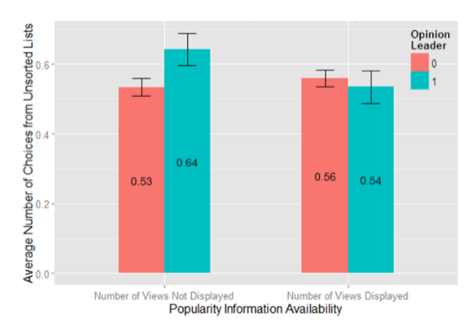 This online experiment examines users’ content exploration and choice patterns in a simplified search environment where users separately control two search dimensions: topic and popularity. relying on popularity in content choice. Intuitively, little exploration along with reliance on the crowd’s tastes will lead, over time, to reduced exposure to diverse content, thereby facilitating the creation of an echo chamber. The Category button enables topical search, and opens a dropdown list of 15 categories. Choosing one of these produces a list of talks in the chosen category, in random order. Clicking the Popularity button sorts the displayed search results by their number of views on YouTube, from most to least popular. When Popularity is clicked before a category has been chosen, the button produces a sorted list of all talks. Users may click each of the buttons as many times as they like, creating a search sequence. 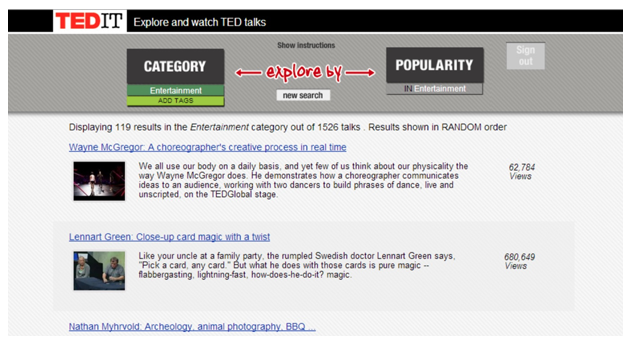 Figure 2 shows a screenshot with search results appearing after a user clicked on Category and chose the Entertainment category. Users’ personal and social characteristics, previous experience with TED content, and opinion leadership were assessed using a series of short self-report questionnaires. We recruited 1,846 experiment participants via Amazon Mechanical Turk. See our paper (Bar-Gill and Gandal 2017) for descriptive statistics on these participants and further details on the questionnaires used. The average TED-it user performed 0.65 Popularity clicks and 1.05 Category clicks. Fully 35% of users clicked only on Popularity, thereby sorting all talks, and choosing from this list. Much like other distributions of media consumption, the distribution of views on TED-it appears long-tailed. Our users watched 532 different talks. 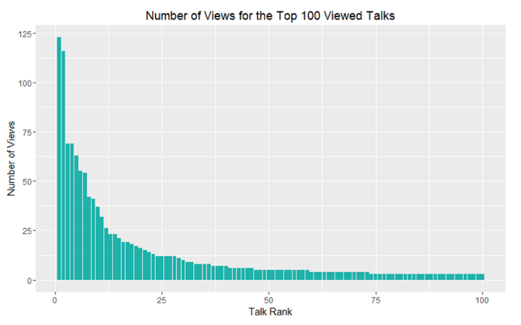 The number of views for the top five talks is 123, 116, 69, 69, and 63, respectively, whereas talks ranked between 107 and 532 had one or two views each (see Figure 3a). While TED-it presents information on talks’ YouTube view-counts, and allows for sorting based on these, the rank order of views on TED-it does not mirror that on YouTube. This is evident from panel (b) of Figure 3, which shows YouTube view-counts for talks ordered by their TED-it views. Intuitively, popularity reliance increases monotonically from (a) to (c). Validating our notion of popularity reliance, the mean YouTube view count is 521,007; 2,909,773; and 5,032,500 in end-states (a), (b), and (c) respectively. The correlation between the TED-it (our experiment) and YouTube view counts increases from ρ = 0.12 for (a)-users to ρ = 0.69 for (c)-users. Lower popularity reliance leads users to content that is less known by their peers, and is more suited to their personal interests. We argue that users who consistently search by their topics of interest and rely less on the crowd’s previous choices are less likely to suffer from echo chambers. Susceptibility to echo chambers in our setting is represented by a low utilisation of category search, along with a strong reliance on popularity sorting. We conjecture that highly social individuals will tend to ‘follow the herd’ and suffer a risk of echo chambers, since they identify strongly with their peers. 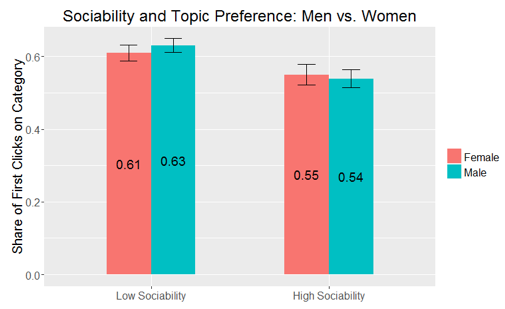 Indeed, we find that highly social individuals show a weaker preference for topical exploration, and rely more heavily on popularity sorting, compared to individuals reporting lower sociability. 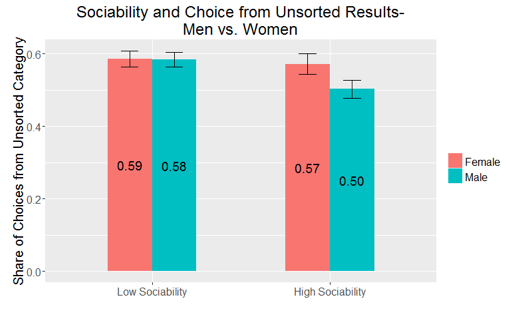 We further find that highly social individuals perform fewer search clicks and are less likely to choose from unsorted category-specific results (see Figure 4). Previous experience with a content space is expected to decrease the tendency to explore in that space, and thus content familiarity is an echo chambers risk factor. The data corroborates this hypothesis for male users. 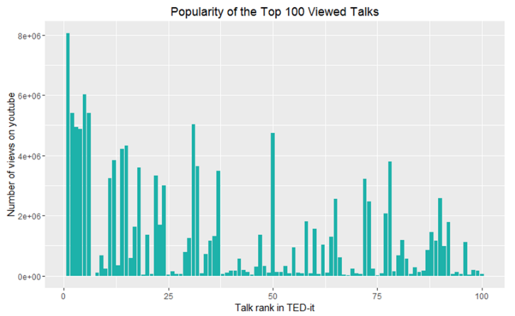 Figure 5 shows that users who have previously watched TED talks are more likely to begin their exploration by sorting all talks, and are less likely to choose a talk from an unsorted list. This effect is statistically significant only for males. Examining the relationship of various user demographics with the observed exploration patterns, we find that younger individuals are less likely to conduct a topical search and rely mostly on popularity considerations. Younger users are thus more likely to get caught in echo chambers than older users. Opinion leaders seek to influence others in their social circles. Since already-popular content decreases opinion leaders’ capacity to act as thought leaders, we expect these individuals to exhibit lower popularity reliance, and search based on their topical interests, to create new avenues for influence. 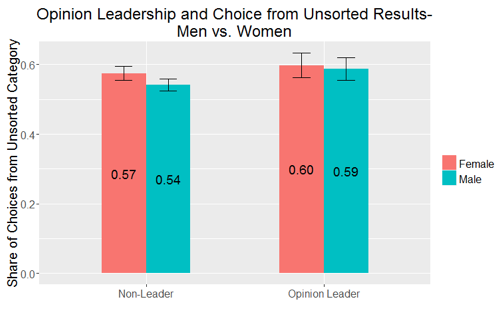 In line with this, opinion leadership is found to affect exploration patterns, but only for men in our sample. 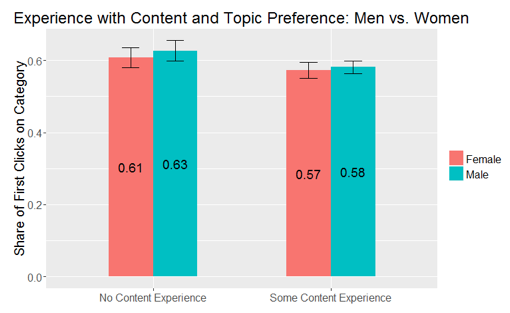 Specifically, male opinion leaders exhibit a stronger preference for exploration by topic of interest and invest more effort in search, performing more search clicks than non-opinion leaders. 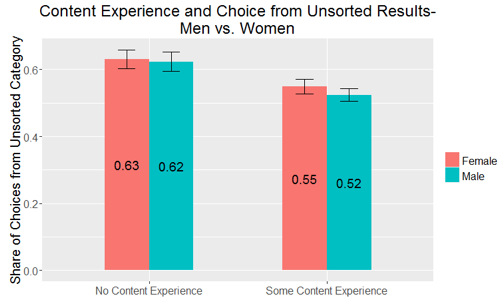 Figure 6 depicts male opinion leaders’ higher tendency to explore by topic and to choose from an unsorted category-specific list (though only the former is statistically significant). These results suggest that opinion leaders tend to introduce new information and may thus alleviate echo chambers in their social circles. Popularity information, such as Facebook like-counts and YouTube view-counts, are baked into our online environments. How is this affecting our tendency to explore unfamiliar territories? On the one hand, popularity information can substitute for sorting, by providing a quality guarantee for content that is not ‘topping the charts’ (i.e. generating thousands, but not millions, of views). On the other hand, it can create increased awareness of popularity considerations and complement them, leading to a stronger reliance on the crowd’s tastes. Whether providing popularity information is a substitute or a complement to sorting is thus an empirical question, which we answer by randomly assigning users to one of two conditions, where popularity information is shown or blocked in category-based searches. 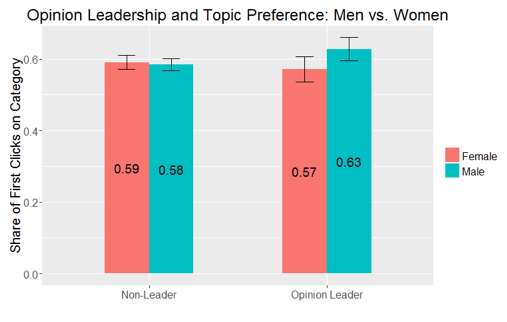 Interestingly, only male opinion leaders are affected by the provision of popularity information, complementing this information with increased sorting, as seen in Figure 7. The strong topic preference observed for these users is therefore weakened in the presence of information on the crowd’s choices. Notes: Share of talks chosen from unsorted Category with and without display of popularity information for opinion leaders vs. non-leaders. Should we suppress, or at least reduce the visibility of, popularity information in our online environments to increase the diversity of the content consumed? To the extent that content diversity is a desired end, the answer is yes. Furthermore, in all our analyses, there were no statistically significant correlations between users’ exploration characteristics and proxies for enjoyment, such as viewing talks past the mandated five minutes or watching an extra talk. 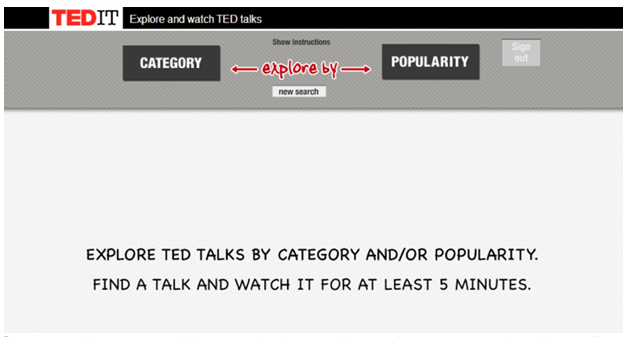 This suggests that in the realm of TED talks, popular content is not inherently superior to less popular content. Therefore, designing online environments that encourage topic-based exploration (e.g. with increased visibility of non-hit content, and reduced visibility of view counts) may ameliorate content echo chambers, with little impact on user satisfaction. Bakshy, E, S Messing and L A Adamic (2015) “Exposure to ideologically diverse news and opinion on Facebook”, Science, 348(6239): 1130-1132. Bar-Gill, S and N Gandal (2017) “Content exploration, choice and echo chambers: An experiment ”, CEPR, Discussion paper DP11909. El-Bermawy, M (2016) “Your filter bubble is destroying democracy”, Wired, 18 November. TED is a non-profit organisation devoted to spreading ideas, usually in the form of short talks (18 minutes or less). TED stands for technology, entertainment and design, though TED talks today may cover any topic (more at https://www.ted.com/about/ ). The location of the buttons is randomised, such that Popularity appears on the right only for 50% of the users. This is to rule out possible location effects. Users had to watch at least five minutes of the lecture in order to receive payment for participation. This requirement has been shown to motivate non-trivial search activity in an early stage pilot.